This month’s Home Movies column threads on a broad selection of films. From a comic Italian picture to an atypical musical, this latest batch have been among some of the more pleasant surprises of the past month – it’s been a busy period for me as I’ve just managed to settle into my new apartment while getting through various work-related deadlines. It’s nearing the end of July though – time is flying. Several years ago I was mesmerized by brutal range of emotions that Lars von Trier was able to extract out of Emily Watson in Breaking the Waves. Afterward, I was similarly leveled by Nicole Kidman’s performance in Dogville. And then there’s Charlotte Gainsbourg in Antichrist – the most impressive female performance of the past ten years. Often spoke of in the same breath, Bjork’s performance in Dancer in the Dark falls in line with the series of female victims in Trier’s films, though perhaps the sheer brutality of what is on-screen seems a bit more tame in comparison to some of his more recent films. Obviously, that’s taking into account Dancer in the Dark’s brutal murder sequence and a gruesome hanging - perhaps Trier has simply desensitized me to his brand of miserablism. Cinema of this nature (one so grounded in the misery of people) simply doesn’t resonate with me as profound. If it weren’t for Trier’s firm directorial presence, I fear I would not have been able to maintain my measure of interest in picture. On a scale of 1-10, my interest in watching Water for Elephants was… well, not particularly high on the spectrum. But I gave it a try, and surprisingly, the picture is effective. While utilizing a useless framing device to structure its narrative, it doesn’t have the same sort of intrusiveness that plagued a film like The Curious Case of Benjamin Button. And much like Button, what really elevates Water for Elephants is the stellar collaborators at Francis Lawrence’s disposal – the gorgeous sun-drenched cinematography of Rodrigo Prieto operates in wonderful contrast to Jacqueline West’s Depression-era costumes and David Crank’s art direction. Unfortunately, a substantial dichotomy between the picture’s aesthetics and writing persists. Still, the triad of Robert Pattinson, Christoph Waltz, and Reese Witherspoon diligently sell the material – and I was buying. Pietro Germi’s ability to adopt a sociological lens without compromising his comedic tendencies in Seduced and Abandoned and especially Divorce Italian Style is nothing short of remarkable. Divorce Italian Style sees Germi analyze the communal nature of a Sicilian family, as Baron Ferdinando Cefalù (Marcello Mastroianni) yearns for his cousin while plotting an elaborate plan to coerce his wife into having an affair. Brandishing a nervous tick, Mastroianni excels as the sort of neurotic husband who fantasizes about a future that is really too good to be true. The film’s richness lies in how Germi constructs the Sicilian neighborhood – much like what was seen in Seduced and Abandoned, virtually every character’s actions are decided by the norms and mores of their community. Complimented by Germi’s excellent framing and clear understanding of his spatial setting, Divorce Italian Style is excels best as a portrait of a man who is confined by a social structure and his futile attempts to work within the system to get what he wants. The wide range of characters that Buster Keaton took on through his career gives him a versatility that cannot be matched. Whereas I always favored Charlie Chaplin to Keaton’s work, I’m beginning to feel a change of heart. The loveable tramp found in City Light and The Gold Rush begins to look a little less complex when faced with the sissy schoolboy in Steamboat Bill Jr., the daydreaming projectionist of Sherlock Jr., or the egotistical one-percenter in The Navigator. What this allows is a level of flexibility in narrative and character that really does give Keaton an edge over his main silent-era rival. The Navigator may just be Keaton’s best picture. It’s larger than the grounded Sherlock Jr., but somewhat less frantic than The General or Steamboat Bill Jr. It’s perhaps the most tightly constructed of all of his films – at a runtime of 60 minutes every scene has such a spontaneous comedic spirit that etches a smile onto your face. Along with being one of Keaton’s most impressive visionary works, it’s immediately identifiable on a personal level. It’s a love story first and foremost, where proving to both yourself and the person you love that you are more than what you may put on. It’s a matter of growing up and accepting a measure of responsibility that’s foreign to them. That’s where a lot of comedy comes from, as Keaton absent-mindedly goes underwater to fix a leak without the slightest clue of how to get it done. It’s all funny material, but there’s a poignancy attached to it that gives it added depth. 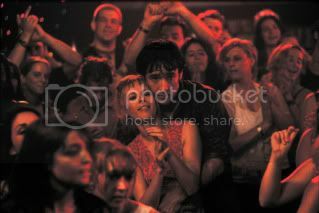 There’s a film coming out this week and it has a lot of people talking, including me. With The Dark Knight Rises, Christopher Nolan completes his Batman trilogy, much to the bittersweet delight of his legions of fans. Nolan’s reputation amongst cinephiles is an oddity. There are his early pictures, Following and Memento, which navigate through a tricky narrative web while succumbing to the restraints found in independent pictures. Then there are his Batman pictures, along with Inception, that disregard budgetary issues and produce great visual spectacles. His development as a directorial force has been an interesting one, as the limits and expansion of his budgetary stroke has had an adverse effect on how he presents his material. Whether it’s the flexibility of memory interpretation in Memento, the dreamscapes of Inception, or moral tests associated with being a hero in the Batman films, Nolan incessantly casts a huge net on whatever his theme he addresses. Unfortunately, by doing this, he loses a sense of personality. 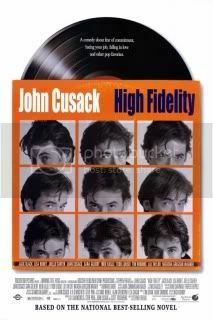 I use the word personality to address a micro level of empathy- the larger his films get, the more they begin to feel like engineered pieces of work as opposed to humanistic efforts. This lack of personal appeal is why I’ve never been swept up by his films. It’s also probably why I find Memento to be his best work. I first saw the picture in my teens and was immediately drawn by its visceral qualities. It has a natural appeal that undoubtedly pulls impressionable viewers. The mystery and allure of its nonlinear storytelling still has significant pull even when you know the twists and turns. And for a film of its type, it’s expertly-crafted. Rewatching the film as a way to jog my memory, I found myself immersed in its narrative trickery. It’s not the sort of thing that I go for nowadays, but I’ll admit that found it to an enjoyable rewatch. Memento was Christopher Nolan’s first brush with the Academy Awards. Rightfully nominated for his screenplay, his presence would not be felt until ten years later with his co-writing in Inception. Much to the disappointment of his fans, he has yet to be nominated for Best Director. Inception has been his only film to be nominated for Best Picture, and that in itself carries an asterisk given that field had expanded to ten. The Dark Knight has been credited as the film to do away with the standard five nominees – that in itself is purely speculative. My belief that The Dark Knight Rises and Christopher Nolan will not be nominated for any major awards is also purely speculative – so let’s not get any death threats here. But unlike The Dark Knight, the picture is not universally accepted. It’s obvious from the somber tone that it is going to push people away. Gone is the bombastic energy that Heath Ledger brought into the fold. I’ll reserve judgment (as I always do) until I see The Dark Knight Rises, but the energy around it is clouded. With very few exceptions, the films that garner Best Picture talk are those that possess lightness and hope. It’s not 2007 where films like No Country for Old Men and There Will Be Blood were in contention. Pictures like The Artist and The King’s Speech dominate; pictures with a sense of personal redemption. Are people going to relate to the physical tests placed before a superhero? Inception and Memento brought Christopher Nolan into awards contention. They are pictures of personal journeys where people can transplant their own feelings about memories and dreams. It’s a personal touch that gets awards attention – films that balance scope with personality. My updated Oscar predictions can be found on the sidebar. For analysis on individual categories, check out the Oscar Predictions page. With four directors (perhaps even a fifth uncredited helmer) it’s not too hard to understand why there’s a rather disjointed feeling to Dreamworks’ The Road to El Dorado. Its lack of cohesiveness isn’t really the only thing that keeps the film from becoming much more than a pleasant diversion, but it’s the most jarring and obvious problem I have with the film. Its lack of directorial consistency and vision unfortunately hinder what could have been a strong little animated adventure. 2000 was an interesting year for animation. Expectations for animated films were still rather reserved, as Pixar was still establishing itself as the premiere American animation house. Dreamworks had a series of misses that never really caught on with the general public, all whilst Shrek was sitting in development. 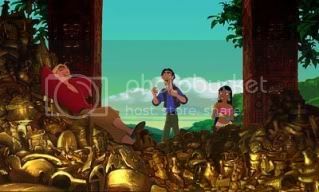 The company was dying for a franchise – The Road to El Dorado had a lot riding on it. The potential for side projects and sequels were obviously thought of well in advance – the adventures of Tulio (Kevin Kline) and Miguel (Kenneth Branagh) with their saucy ethnic girlfriend Chel (Rosie Perez) seem less like organic characters and more like ideas spawned out of a board room meeting. But I don’t want to dismiss The Road to El Dorado entirely, as the film obviously borrows from good company. While not original in the traditional sense, the film subscribes to the ideas of so many action films of years past, that it fleshes out the material to be more inventive than it probably is. And given that its animation style harkens back to a traditional animated style (minus the application of some glaring computer animation), there’s a certain novelty to its visual appeal – had it been released sometime in the middle of the aughts, I suspect its critical reception would have been slightly more favorable. 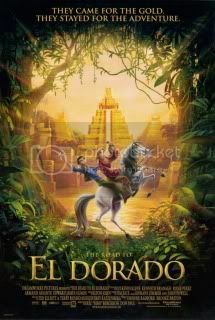 Simply put though, The Road to El Dorado is too slight to really leave much of an impact. It does an adequate job of establishing its characters within the context of its narrative, but ultimately, there isn’t enough to hold it together in the grand scheme of things. Individual sequences work efficiently, so much to the point that it might have worked as some sort of Saturday morning cartoon show. But undoubtedly a result of its multiple directors, the film seems too preoccupied with trying to figure out what it wants to do, rather than actually going on to doing it. So, Nick Park has an established commodity in the Wallace and Gromit franchise, and instead of investing his time into expanding their 30-minute adventures into a feature film, he opts to tackle an original concept. How… daring. It’s that sort of mentality that makes him such a respectable figure – instead of remaining in his comfort zone with well-established characters, he proceeds with an entirely new project. 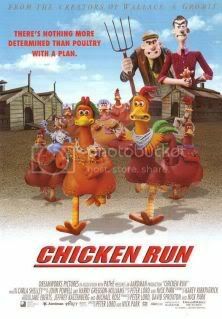 That said, Chicken Run does thread some familiar ground, particularly if you’re aware of the films that have inspired its genesis. Films like The Great Escape, Stalag 17, and The Bridge on the River Kwai obviously served as inspiration for the film’s characters and narrative structure. The plotting follows as such: chickens dare to escape Mrs. Tweedy’s grounds. The chickens live in constant fear of not producing enough eggs or being turned into chicken pie. They try to go over the fence, under the fence, in disguise, and under cover of darkness with unsuccessful results. It’s only when a flying rooster named Rocky (Mel Gibson) arrives that the chicken coop begins to feel confident that they can finally pull off the escape. 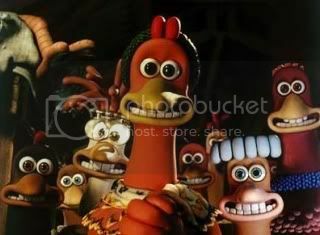 What makes Chicken Run a cut above the rest is its rich characters. Ginger (voiced by Julia Sawalha) is the film’s heart, offering moments of poignancy as she hopes for things that expand beyond her surroundings. She’s level-headed in her attempts to escape, but caring enough to realize that her escape plans need to incorporate everyone. Other characters may play archetypes, but they’re so fully realized that it hardly matters that they subscribe to cliché. The salty rooster named Fowler (Benjamin Whitrow) made me happy that I had watched Alec McGuiness in The Bridge on the River Kwai a month before – his character fit organically within the narrative while providing a nice nod to McGuiness himself. 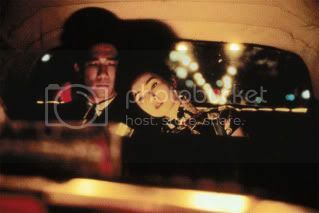 The stop-motion animation is impressive, an expected feature of Park’s films. The clay figures are richly detailed, having the quality of being both vibrant and dull given the situation. My quibbles with the film are minor, and stem mainly from a disappointingly uninspired love story that doesn’t really go anywhere. But the design and general structure of Chicken Run is sharp- everything from the sound design to the intricate ways the chickens move give you a sense that a variety of craftsmen and artists came together to make the best film possible. And given the tedious nature of stop-motion animation itself, it’s an artistic and impressive feat.